A Griffin Scorned & A Kindle Fire? My publishing company Just Ink Press has a pretty spectacular giveaway happening right now and it lasts through the 25th of October! Veronica R. Calisto‘s debut novel A Griffin Scorned will amaze and dazzle you. If you’ve already read it, we’d love to hear from you! We appreciate our readers and hope you continue to enjoy the quality reads we put out. We have exciting news! 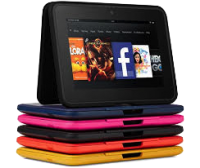 The Kindle Book Review’s next Kindle Fire Giveaway runs Oct 12-25. The FALL BREAK KINDLE FIRE GIVEAWAY, co-sponsored with Just Ink Press and Veronica R Calisto, is promising to be an exciting event! Anthony at Digital Book Today will also throw in 4 – $50 Amazon gift cards, making this an almost $400 giveaway. Are you excited yet? Getting pumped up? We’re talking a Kindle Fire HD! And gift cards. Fifty dollar gift cards. The real act here is Veronica. A Griffin Scorned is brilliantly written and will keep you turning pages. What better way to read it than on your own new Kindle Fire? Keep watching this space as we bring you news and updates as the event unfolds. We are looking to promote this extensively, and hope you’ll join us. Details will follow as we get moving in this exciting giveaway, including how to enter. We want our followers to get as many chances to win as possible. What’s a better way to spend October than reading about griffins and entering giveaways? Imagine the books and candy you can buy with 50 bucks. If you’ve read A Griffin Scorned, then you know what a spectacular read you have been treated to. Tell your friends and family, and tell Veronica. Writers love to hear from their readers, and she’s no different. Go on, leave a review! We’ll continue our look at Veronica and A Griffin Scorned as she helps host this wonderful party. Are you ready? Visit the Kindle Book Review website to enter the giveaway or enter below, and GOOD LUCK!!! Now, if you’d be so inclined as to share this post or the Just Ink Press post as much as you can across your social media, this could be a great giveaway!